Tanning is something you have to have patience for and I for one do not have a lot of that. I’m a very pale girl and it is not easy for me to naturally tan so something out of a bottle is always my safest bet – I honestly prefer a fake tan to a real one as well. So what do you do for a lazy girl like me who likes to have some gorgeously tanned pins? Well, there’s only one answer to that I think and this is Instant Tans. I have no idea why I’ve never thought of this before / tried them before, but here we are for my latest ‘New Found Love’ post. Instant tan came into my life last year when I found a bottle of St Tropez Instant tan in a copy of a Magazine thatI’d bought. Not being one for tans back then I chucked it into the back of my Alex Drawers to forget about it until just last week. There’s something about being called a Milk Bottle at work that can really persuade you to get the tanning bug back, I tell you now. Everyday since then I have used this and have now used up the 50ml bottle, been out to purchase a couple more and can probably say I am now a little obsessed! St Tropez Instant tan (100ml) is around £10 depending on where you go, but it is definitely worth it (I actually think that’s really reasonable for St Tropez) and a full bottle will last me about 3-4 weeks depending on how much of my body I tan daily. I usually only tan my legs from my thighs down as my shoulders tend to naturally brown a tiny bit and this Instant tan is so natural looking. I also picked up a tube of Rimmel’s Sun Shimmer Instant Tan in light (which I think is about £6.99) and I honestly love this tan too! As you can see from my photo above they both give such a great result and look pretty similar. 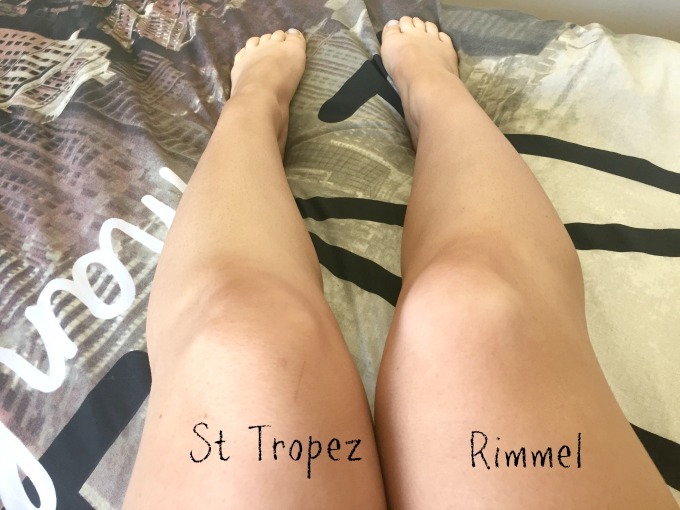 I think for colour though, I prefer the St Tropez for a natural glow and the Rimmell one is a favourite for shimmering flawless legs! They’re definitely my new favourites for Summer and I love the fact that it easily washes off in your next shower too. Have you ever tried Instant Tans? Will you be picking up some of these soon? A milk bottle! Bless you! I have tried both of these and actually like them both. They are very similar, but I find the St Tropez is a little deeper in colour, opposed to the Rimmel equivalent which has a more orange undertone. wow they both look great! The Rimmel tan is so impressive considering its a high street brand I would have thought that St Tropez would have a really different effect. 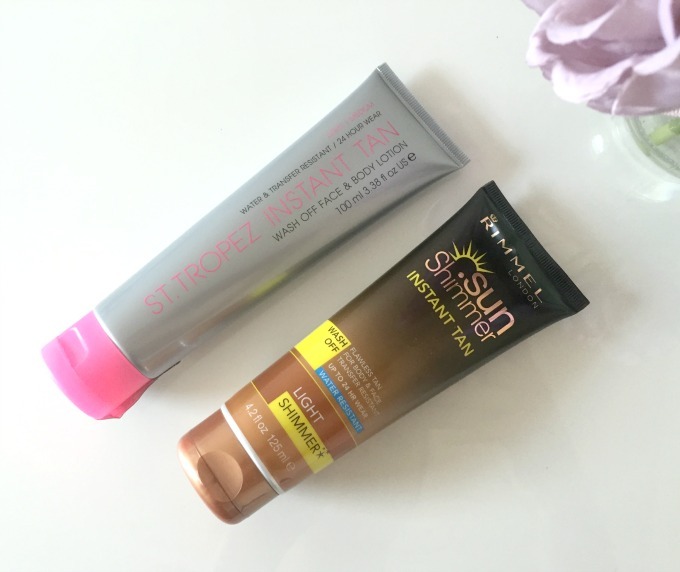 I swore by that Rimmel tan when I first started tanning, and St Tropez is always a good choice! I would also recommend Cocoa Brown for a slightly cheaper alternative, and St Moriz for a MUCH cheaper one!